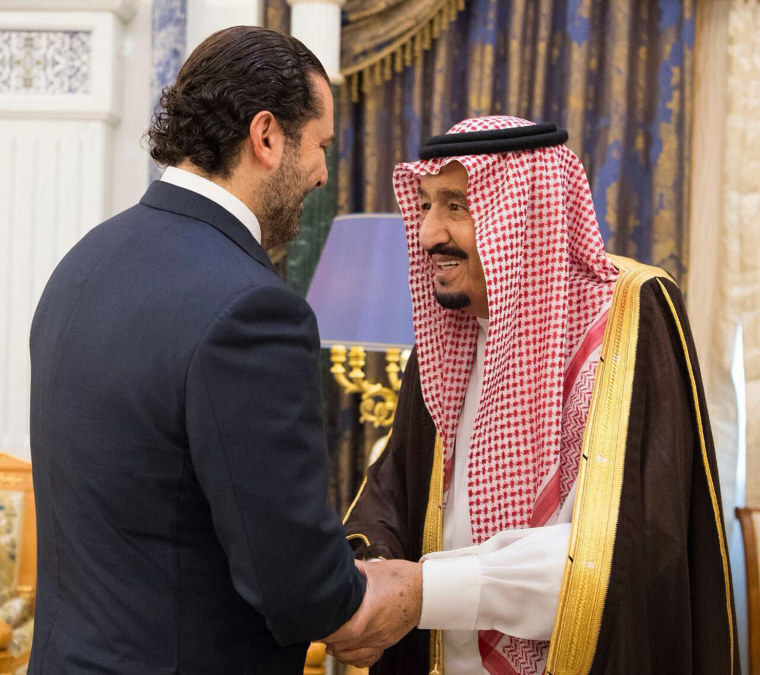 WASHINGTON — Saudi Arabia's order for its citizens to evacuate Lebanon is the latest ominous signal in an escalating confrontation between the Middle East's chief regional rivals, the Kingdom of Saudi Arabia and the Islamic Republic of Iran. The two nations have long fought proxy wars against each other, but many fear that the newly empowered Saudi Crown Prince Mohammed bin Salman is looking to assert Saudi Arabia's regional dominance at any cost. The conflict heated up last year when Saudi Arabia executed a Shiite cleric and then severed diplomatic ties with Iran. Now the Saudis are publicly airing their disapproval with Iran's chief foreign affiliate, Hezbollah, which has significant representation in Lebanon's parliament and has asserted its influence in neighboring Syria. Experts, however, don't think a regional conflagration is imminent. "The Saudis have always thought the wrong solution for their problem with Iran and now their hope is the Trump administration will come in and tilt the balance in their favor," said Ali Vaez, the Iran project director at Crisis Group. "It's unlikely to change Iran's regional policy — Iran will continue to support its allies and proxies in the region — but it's unlikely to result in a major conflict." Even if the conflict doesn't boil over, there is plenty at stake for the U.S. and the world in the battle between the Kingdom of Saudi Arabia and the Islamic Republic of Iran. There's the price of oil, which rises during crises — an ironic benefit to the belligerents, who have some of the world's largest oil reserves — and there's the regional balance of power. The Trump administration has already chosen sides. It's backing the Saudi program of change, and doing what it can to undermine the Obama administration's nuclear deal with Iran. Trump dubbed the Iranian government a "fanatical regime" and warned of a "sinister vision for the future." His rhetoric was music to the ears of Arab officials, in Riyadh and around the Gulf, who had viewed the Obama administration as complacent toward their longtime foe and neighbor to the East. Many of Washington and Riyadh's issues with Iran are really guilt-by-association. Lebanon's Hezbollah, increasingly a leading political force in the country, receives financial and logistical support from Iran and also supports militant Shiite groups in Yemen and Iraq. The U.S. wants to contain Hezbollah's militant faction, which it and its Arab League partners have dubbed a terrorist organization. Once lauded in the Arab world as a heroic resistance movement that stood up to Israel, Hezbollah has seen its popularity plummet among Sunni Muslims because of its staunch support for Syrian President Bashar al-Assad. But efforts to root out Hezbollah have been complicated by its formal role in the Lebanese government and effective control over the country's south. Lebanon's Prime Minister Saad al-Hariri abruptly resigned last weekend while in Riyadh, saying that his life was in danger. He said Hezbollah has created a "state within a state" in Lebanon and was holding the country hostage, and that Iran was meddling in Arab affairs. Tensions reached a new level this week when both Saudi Arabia and Bahrain ordered their citizens to leave Lebanon. The U.S. also shares the Saudi regime's goals for the Arabian peninsula. It wants to defeat the Sunni terror groups in Yemen — al Qaeda in the Arabian Peninsula, the terror group's most potent affiliate, and an emerging ISIS presence. Both the U.S. and the Saudis want to contain the country's Iran-backed Houthi rebels who have growing influence in the country. The Saudis began striking the Houthis in 2014. However, unlike the U.S., which uses precision technology for its strikes against al-Qaeda, the Saudi campaign has been anything but discrete, devastating the country and plunging it into a deep humanitarian disaster. Its war against the Houthis has made the Saudis even more unpopular inside Yemen than they already were — and cost the Saudi treasury a fortune. The U.S. is not the only would-be power broker consulting with the new Saudi leadership team. French President Emmanuel Macron arrived Thursday in Riyadh for meetings amid the rising regional tensions. And the Saudis have hedged their bets, meeting with Russia's energy minister in Riyadh this week and with Vladimir Putin in Moscow last month. Still, the synergy between the Trump administration and the reconfigured Saudi leadership has observers worried whether it will fan the flames. "The U.S.-Saudi convergence of policies very concerning," said Rami Khoury, a professor of Middle East politics at the American University in Beirut. "They've been brought together by four or five policy aims: protect Israel, beat back the terrorists, push back Iran and Hezbollah, keep the oil flowing, and promote business deals all under the umbrella of autocratic Arab leaders." Vivian Salama is a reporter for NBC News.